The Remidi glove is a crazy mash up of music, technology and fashion which was dreamed up by CEO Andrea Baldereschi with help from CTO Mark DeMay and a small team of Italian engineers. Formally a DJ and intern for DeMay's former company, Baldereschi wanted to quickly translate his music ideas straight to his fingertips without worrying about anything in between. After a year and half, the Remidi glove was born. 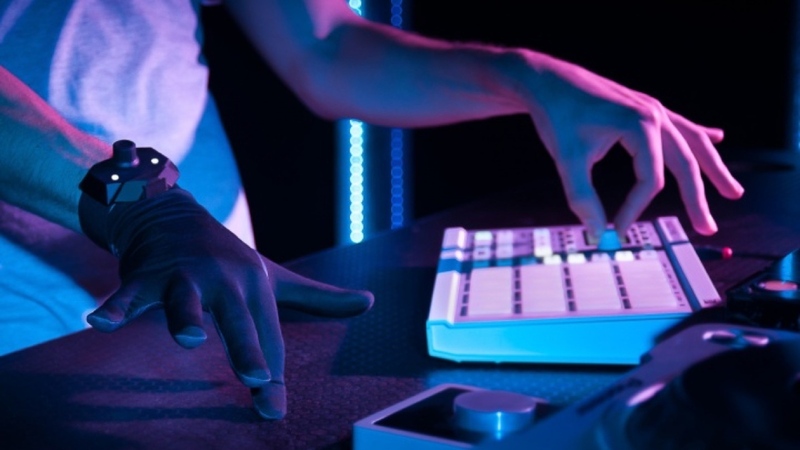 The wearable is essentially a digital interface controller in a glove that can interact with laptops, iPads and whatever else is running compatible MIDI software and is able to connect via Bluetooth. Made from polyethylene terephthalate and thermoplastic polyurethane smart fabrics, eight pressure sensitive sensors in various parts of the glove and a wristband, you can compose music, control synth samples and mix music on the go. Controls include taps on a hard surface, twisting the wrist, opening and closing the hand and so on, which will produce all sorts of sounds and effects depending on what you program into the glove. Length and pressure of your hand gestures also determine the different kinds of music you can make. All of this is aided by a wristband controller which has two buttons for play, pause, or record, and an encoder nob to scroll through note sets. The Bluetooth MIDI (software) already exists. Apple developed it within the last year. DeMay says there will be an app for iPad and Mac laptops though the app is aimed at beginner musicians, which will be useful since the glove might take some time to get used to. "The app is a way to get super beginners in, having fun. Fire audio samples, record yourself and we'll be providing remix packs. You can change different settings, sounds, house music, hip hop, whatever. You can change what kind of song you're playing and even within a song, change through different parts of the song to record your own remix. Then for the Mac, we're building a bridge that goes between the glove and software you already use on a professional level. It'll allow you to change the MIDI notes the glove plays as well as set chords on the fingers, set the ranges for the accelerometer, providing a lot of control and customization." The glove will provide about six hours of battery life via a USB connection. The fabric portion can also be washed. There's also the option to wear two gloves but the team is looking into ways to make the glove reversible - though DeMay says he's still not sure how that will work just yet. Remidi's Kickstarter campaign is almost over and is already fully funded and has even surpassed its goal. However the campaign ends 18 March where backers can still grab one glove for $230, or a pair for $400, saving half off the retail of $400 per hand. The Remidi is expected to ship this October to backers and hit stores in September.